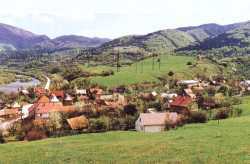 The village of Nolcovo is situated in the north-eastern part of Turiec region and on the left bank of Vah river. It is surrounded by beautiful nature and by two magnificent mountains - Velka Fatra and Mala Fatra. The first written reference dates from 1489 and in 1989 the village organised a big celebration of its 500th anniversary. The inhabitants of Nolcovo have worked in the area of agriculture and farming in the past and it was the most important source of their income. Farming features on the coat of arms of Nolcovo. It features golden seeds and farming tools on a red background. The name of village comes from the name of Mr Nolca or from Hungarian number 8 which is nyolcz. Another interpretation is that the name of the village comes from sheep farming history. Many bronze needles were found in the area of village and on the nearby hill of Hradisko. It documents that the first inhabitants came during the Bronze Age. The village is known for being an important station on a busy post route which was built in 1610 and in 1667 the post office was established here having many horses for that service. The village spreads over 1501 hectares and the highest point is a hill called Klak which is situated 1359 metres above sea level. The hill lies on the edge of so called Velka dolina (Big valley) which is 7 kilometres long. The lower part of village is situated on the bank of River Vah which is 406 metres above sea level. Nolcovo was one of the first villages which installed television cable systems into households and also had village radio broadcasting. The major activities of village are around fruit orchards which brought business into Nolcovo. 800 fruit trees were planted and they bring good crop every year. Sport and culture plays an important role in the village life. Winter walk to Magura (1061 metres above sea level) and summer walk to Klak hill which is organised by group of local villages. The village has two football pitches, a tarmac tennis court and suitable public pathways and cycle trails. The fishermen can enjoy their hobby and do fishing in the nearby ponds which also attract people who like ice skating in the winter. Easter celebrations, meetings of older inhabitants, hog-killing and other local traditions are still very much alive in the village. FURTHER ATTRACTION: the village is located on the left bank of Vah river and on the edge of Velka Fatra mountains which provides good opportunities for fishing and hunting. Nolcovo village established its own orchard business and focuses on fruit growing and processing. The tradition of sheep farming is very much alive and finds a home amidst the local natural beauty of the area.